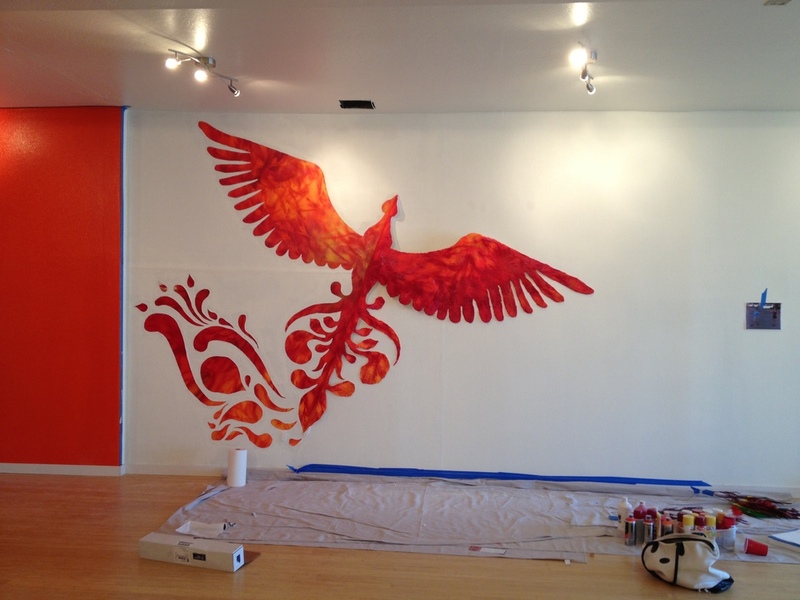 In August of 2013, Firebird Dance Studio closed their old studio, moved to a new home in Mountain View, and the old mural I painted was no more. So, I painted a new one! This time I was inspired by what the Firebird symbolizes: something elusive and extraordinary, hiding in an ordinary world. So I decided to try a dimensional mural. One that looks like part of the wall — shaped like a wing — is being peeled back to reveal something magical and imaginative hiding just behind the plain white-washed wall. What unfolded was the awesome — and sometimes maddening! 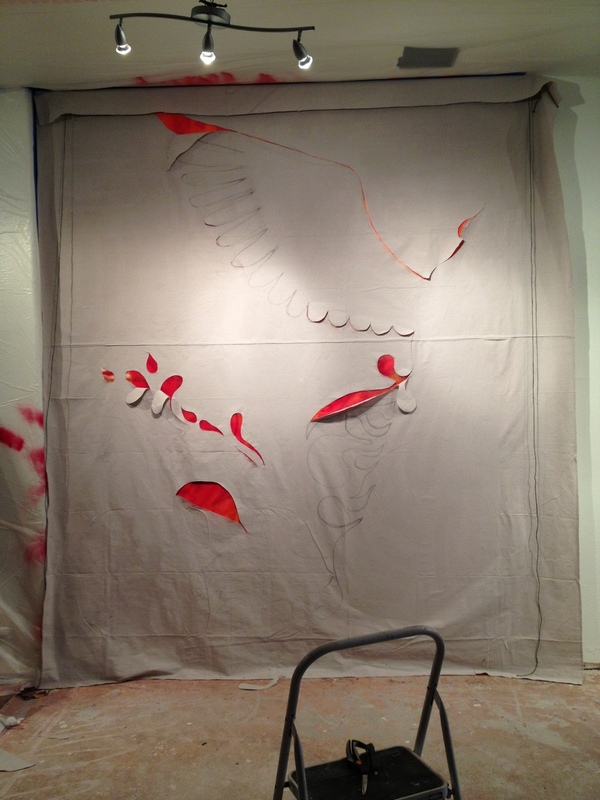 — process of turning a sketch into a 40' x 10' wall with paint, fabric, wire, and plaster. What a challenge. I'm so happy I did it. 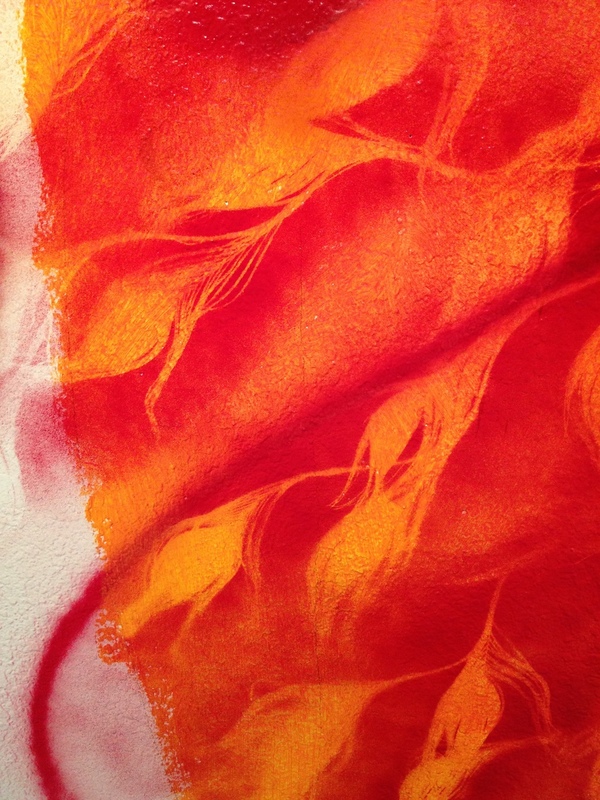 Take a look at the process journal below. And then check out the finished mural here or at 1411 W. El Camino, Mountain View, CA. Let's try out the symmetrical bird peel-back effect. It works, "on paper"
Pattern Detail from the bottom layer of the mural. Next, I covered the bottom layer with canvas, and began cutting out a massive bird. Half a bird is emerging, from behind the wall's top layer. The second half of the bird is taking form. Side-effect: I'm covered in plaster. A fully-formed, dimensional bird is ready to be painted. After all those hours of cautious calculations, and slow progress, it feels so good to just let loose with the spray paint! The firebird is complete. Now to paint in the rest of the story. Finished! I finished up the mural during Labor Day weekend, just in time for the Studio's grand opening, September 3rd. This was awesome. I need a nap. You can find more photos of the completed mural in the projects section.